India and Sri Lanka on Saturday vowed to find a permanent solution to the vexed fishermen issue at the earliest. The two sides held ministerial-level talks on the issue during which various aspects related to it were discussed. The talks were held between minister of agriculture and farmers welfare Radha Mohan Singh and Sri Lanka’s fisheries minister Mahinda Amaraweera. “The ministers agreed that a permanent solution to the fishermen issues should be found at the earliest,” the ministry of external affairs (MEA) said in a statement. The ministerial-level meeting was followed by the third meeting of the Joint Working Group (JWG) on Fisheries yesterday. 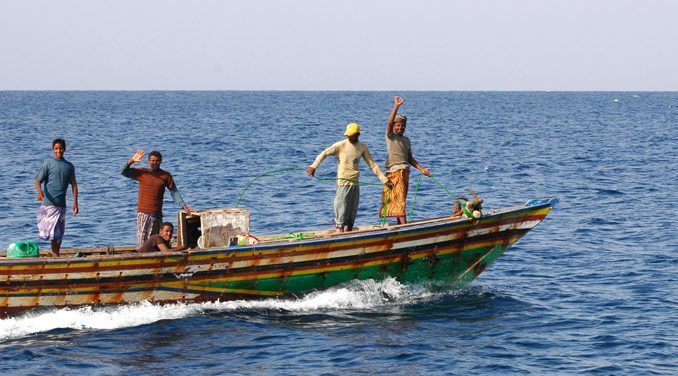 “The Indian side was satisfied with the progress on release of apprehended fishermen and detained fishing vessels in the recent past, while reiterating the release of all the remaining Indian fishing vessels in Sri Lankan custody,” the MEA said. The statement said that India also apprised the Sri Lankan side about the recent initiatives taken by it to end bottom trawling in the Palk Bay area. India also informed the Sri Lankan side about alternative livelihood opportunities being offered to the fishing communities in Palk Bay area through open sea cage farming, seaweed farming and other allied coastal fisheries activities. The Joint Working Group meeting was co-chaired by Secretary, Department of Animal Husbandry and Fisheries, and Sri Lanka’s Fisheries and Aquatic Resources Development Secretary. While acknowledging the efforts taken by India to end bottom trawling, the Sri Lankan side informed about the measures taken by its government to prevent illegal fishing, the MEA said.